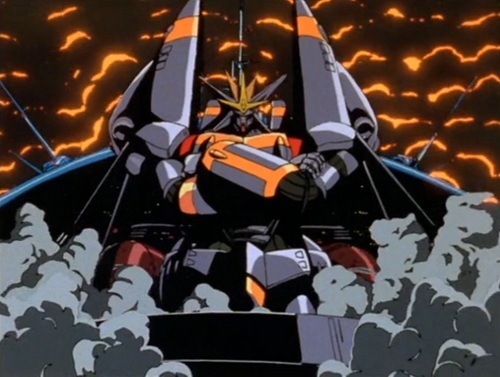 I had low expectations when I bought the Gunbuster movie on blu-ray. The visuals looked underwhelming, as did the plot summary. Still, I felt that as an anime fan I had an obligation to watch a Gainax classic, and I’m happy I did. Gainax could have created a forgettable story about girls battling aliens with giant robots. Throw in some fan service, and the show would have practically written itself. Instead, Gunbuster is a story that doesn’t pull any punches and explores deep, emotional issues. The only downside of watching Gunbuster on blu-ray was that the movie version left out a number of scenes that were included in the OVA. I enjoyed the movie, but I’m left wondering if the original version would have provided a better experience. My favorite parts of Gunbuster occur when the characters confront difficult situations and find no easy solutions. One of the major plot points revolves around the fact that the characters in space age more slowly than those on earth. Although the main character, a high school girl named Noriko, only fights in space for four months, by the time she returns to earth, ten years have passed. When she arrives home, Noriko finds that her friends have grown up and moved on without her. The themes Gunbuster explores, including loneliness, the human will to survive, and dealing with depression, foreshadow the themes that Gainax revisits in Evangelion. Like Evangelion, Gunbuster’s Noriko is forced to defend humanity against aliens with the help of a giant robot. Like Evangelion’s Shinji, Noriko suffers from loneliness and self-confidence issues and initially cannot meet the high expectations put on her. In one scene, Noriko thinks for a moment that she can reunite with a loved one. The audience knows that she is mistaken, and when Noriko realizes it as well, she goes momentarily crazy. While I’ve never had that happen to me, I could easily see it happening in real life. Ultimately, Noriko’s struggles do not seem as dramatic as Shingi’s, nor was the emotional impact of Gunbuster as deep. Still, I empathized with Gunbuster’s characters. The emotions they experienced seemed like they could be real. One upside to Gunbuster is that it’s nowhere near as bleak as Evangelion. I found Shinji’s debilitating depression difficult to stomach and I gave up watching Evangelion several times before I finished it. I had no similar problems with Gunbuster. The aspect of the Gunbuster Movie I hated most was the movie format itself. The time limit of the movie, around an hour an a half, forced Gainax to smoosh together three discrete stories into one. Gainax did so by cutting a number of scenes from the first few episodes in a way that I suspect dulled the impact of the story. For example, Noriko’s meeting with her temporary partner Smith Toren, left out the scene where the two first met. I wonder if my understanding of the relationship between Noriko and Smith is incomplete because I did not watch a significant part of their relationship happen. I would prefer to watch the OVA version of Gunbuster, but unfortunately it’s not available I and expect this situation to become more common. For example, Sentai Filmworks recently released the Fate/Stay Night movie on Blu-Ray. Meanwhile, the original television series is out of print. The most recent Ebay auction for the Region 1 version of the Fat/Stay Night television series sold for $86. This situation isn’t too surprising, it comes down to economics. It’s likely more profitable for anime companies to sell a movie on DVD for $20 movies than a four DVD set (like the series in Funimation’s classic line) for $25. 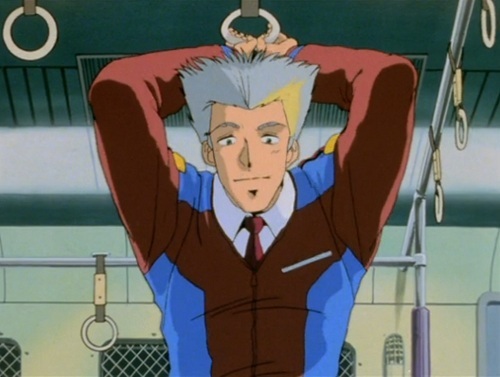 I wish that I could have watched the OVA series, but I’m by no means unhappy with the movie. I’d rather enjoy a piece of Gunbuster by watching it on blu-ray than miss out on the series entirely. Gunbuster is one of my all time favorite anime series. Yet I’ve never watched the movie – and don’t think that I ever will. I sure hope the series gets a US Blu-ray release someday. I’m probably one of the few people who have Gunbuster in every media format: VHS videotape, Laserdisc, DVD, and Blu-ray. The Laserdisc and Blu-ray boxes are the Japanese releases, so they don’t have subtitles. I think a US blu-ray is unlikely, if the gun buster movie daily deal on crunchy roll is any indication. It looks like my only hope of seeing the full version is eBay. That being said, the movie version is an authorized, if imperfect, version. If you are an avid fan of the series I’d watch the movie adaptation at least once. One of the major supporting characters (with the best name ever) was wholesale cut out from this version. Diebuster doesn’t fare any better, so it’s best to do yourself a favor and see the OVAs in full. I will at some point, I’m just waiting to find it used at a reasonable price. I think I will have to see if I can get this one. I would love to watch the OVA, but sadly don’t think that it’ll ever be an option for me. It’s impossible to find in the states!